1. Send emails using the SparkPost API. 2. 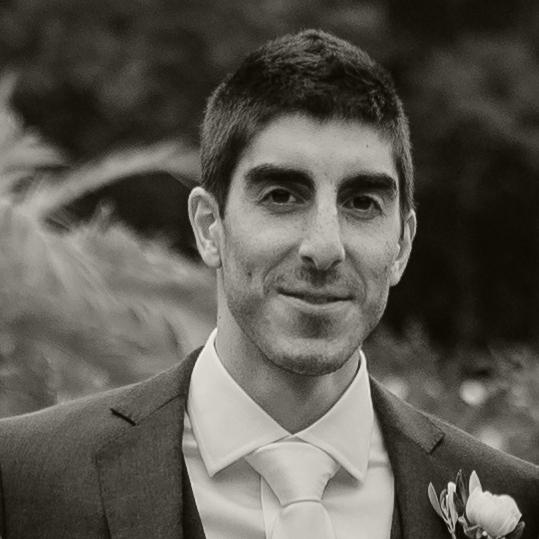 Keep track of bounced emails using webhooks. If you’re already comfortable working with email delivery services, setting up your own mail servers, etc. then this post is not for you. But if you’re just getting started with email delivery or would like a straightforward, step-by-step guide, then keep reading! You don’t need advanced technical skills to set up Mautic and SparkPost, but you should be able to follow instructions and create/edit DNS records. Before you dive into Mautic’s settings, you need to get things ready in your SparkPost account. Follow these instructions to set up your account: Getting Started with SparkPost. You will add and verify a sending domain, and then wait for SparkPost’s “compliance check” to approve your domain. To receive approval from SparkPost, you must have a live website with actual content on it. You cannot have a placeholder or “coming soon” page. Check out SparkPost’s website requirements for more info. You will not be able to send any email until your domain is approved. In your SparkPost account, go to Account > API Keys, and create a new API key. Give it a name (can be changed later), and select all permissions. Click the “Add API Key” button, and make sure you copy and save the key that displays. This full key will only be visible one time. From your Mautic dashboard, go to Settings > Configuration > Email Settings. Choose SparkPost as your “Service to send mail through”, and paste in your API key. Press “Test connection” to make sure things are working. Note that after testing, your API key may not be visible, but your test should still work. Make sure you use a “send from” email address that uses the domain you verified with SparkPost! If you try to use an email with a non-verified domain, you will have trouble sending. 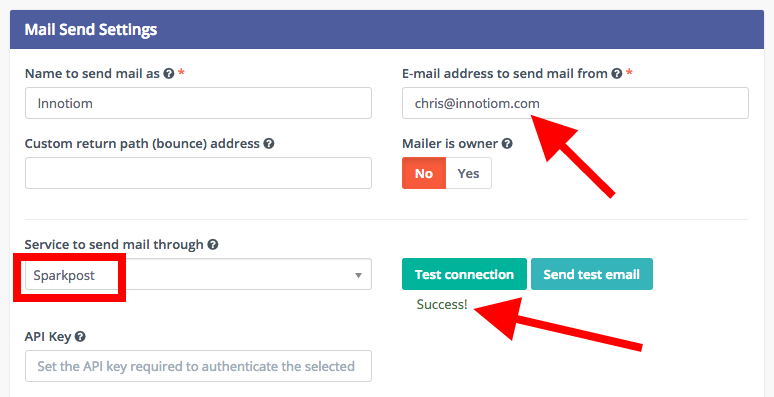 Press the “Send test email” button, and Mautic will send a test email through SparkPost to your Mautic user account email address. When you’re done, hit “Save & Close” in Mautic to make sure your email configuration settings are applied. Okay, great job – you’re now ready to send emails with Mautic. But before you do, it’s important to set up a way to manage any bounced emails. Otherwise you might unknowingly send email to addresses that have bounced – very bad for your sending reputation! When you send email with Mautic and SparkPost, you can actually log into SparkPost to see which emails bounced, were delayed, etc. That’s great, but what you really need is to have Mautic mark bounces as do-not-contact. Note: this approach uses webhooks – so you do not need to set up a monitored inbox. 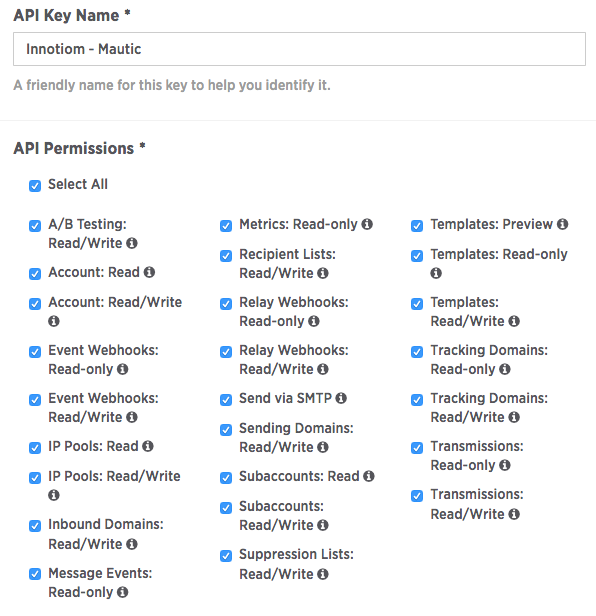 But you should already have Mautic and SparkPost configured using your API key from Part 1 of this guide. Credit for this information goes to Luiz Eduardo. His original post is in Portuguese, so I thought I’d include the same details here, but in English. Replace http://your-mautic.com with the URL for your Mautic install. With your webhook set up, Mautic will begin marking any bounced emails as “Do not contact”. To make it easier to see which emails have bounced, you can set up a “Bounces” segment in Mautic. From your Mautic dashboard, go to your Segments and click the “+New” button to create a new segment. Name the segment “Bounces” or something similar. For the filter, choose “Bounced – Email” equals Yes. Save your new segment, and you’re done! Going forward, Mautic will automatically mark contacts with bounced email as “Do not contact”. Your mautic:segments:update cron job will then add those contacts to the new “Bounces” segment you just created. Now that you’re all set up, what about starting with a basic newsletter? Check out my guide to sending newsletters with Mautic. If you run into trouble, double check that your SparkPost sending domain is set up correctly. 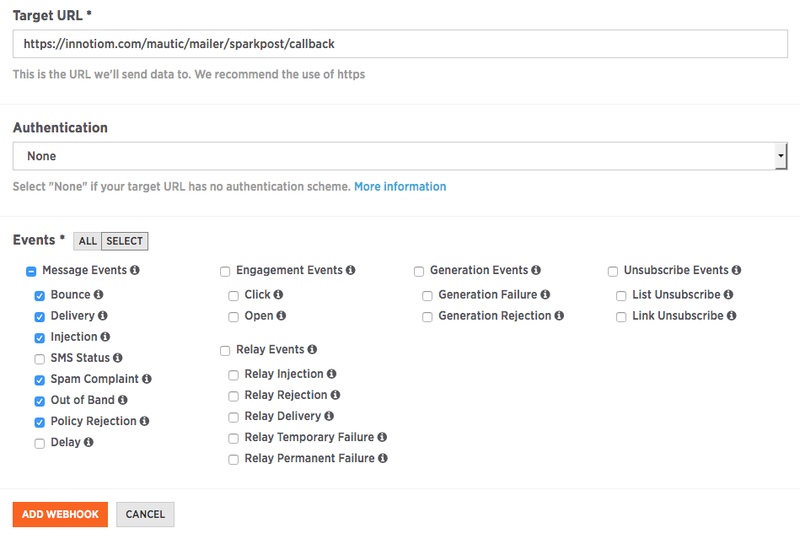 Also make sure that your webhook settings in SparkPost are set to process immediately (in Mautic: Settings > Configuration > Webhook Settings). If they are set to “Queue Events Only”, you will need to add the mautic:webhooks:process cron job to process your bounces. 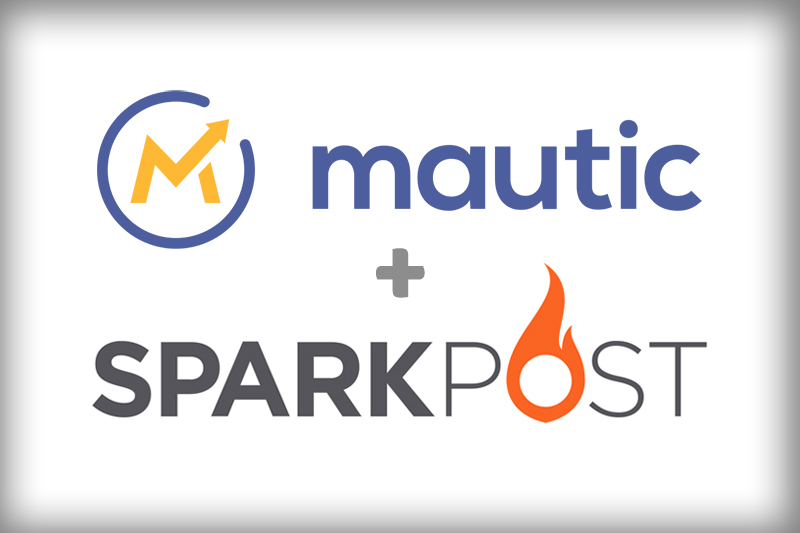 Remember to take advantage of SparkPost Help, Mautic on Slack, and the community forums too. If you find errors in this guide or want to suggest improvements, please contact me!